Let me begin with a confession: Four years ago, when Aaron Woolf, Ian Cheney, and I started work on the film that became "King Corn," we sure didn’t imagine we’d still be at it in 2007. That said, here we are, and we can’t much complain. The film is opening in theaters this week — a rare treat for a movie, not to mention one about watching corn grow. 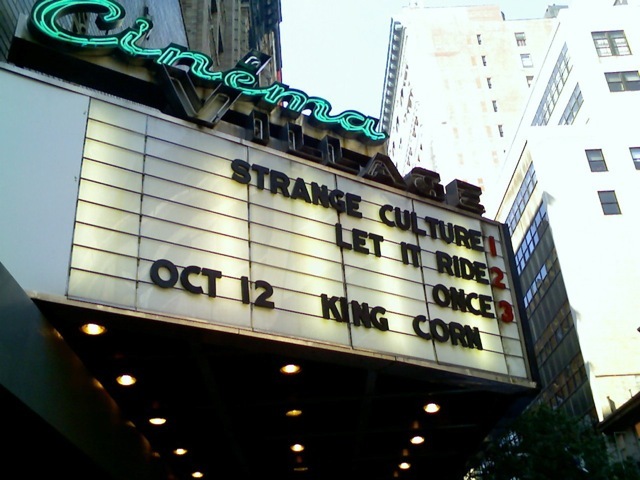 We’re here in New York now, handing out postcards and answering questions and waiting nervously for Friday night, and it has me thinking about why we set out on this curious corn-movie adventure in the first place. On the F train this morning, I got a nice reminder. A friendly-faced young woman with a bum knee and a crutch picked the seat next to me and sat down. In that nice way that always seems to happen in this town, I held her coffee and she asked me a question and we got to talking. I gave her the briefest of my stock summaries of the movie — two guys, I’m one of them — move to Iowa, grow an acre of corn, and follow it as it becomes high fructose corn syrup and corn-fed meat. “Wow! That is so interesting!” What? No, perhaps you misunderstood; it’s a movie about the farm subsidy program, anhydrous ammonia fertilizer, commodity prices, and other highlights from the official listing of the Most Boring Topics Ever. My first thought was, well, this is the woman for me. Since that was going nowhere, my second was, that’s true — a lot of people our age are interested in this farming stuff. Why? Genevieve then told a story I think a lot of us share. Her family used to have a farm in the Midwest (Botkins, Ohio); they’d been there since 1850. Her mom left rural life about as fast as she could, so Genevieve grew up in New Jersey. But for her, the old farm didn’t feel like a dead end at all. She loved the big barn and the open space, and had some romantic (but in my opinion pretty darn reasonable) ideas about how rewarding it might be to grow her own food. The farm stayed in her family until only recently, when the ethanol boom drove the price of land up, and their 100 acres became part of a neighbor’s much larger operation. With less than two percent of Americans now living and working on farms, our nation’s iconic lifestyle is almost extinct. “I actually almost moved out there,” Genevieve said. Almost moved to Botkins, Ohio? Are you crazy? This is a born-and-bred New Yorker talking! But it turns out Genevieve is like a lot of people our age. She just turned 30, and thinks farming actually sounds kind of fun. 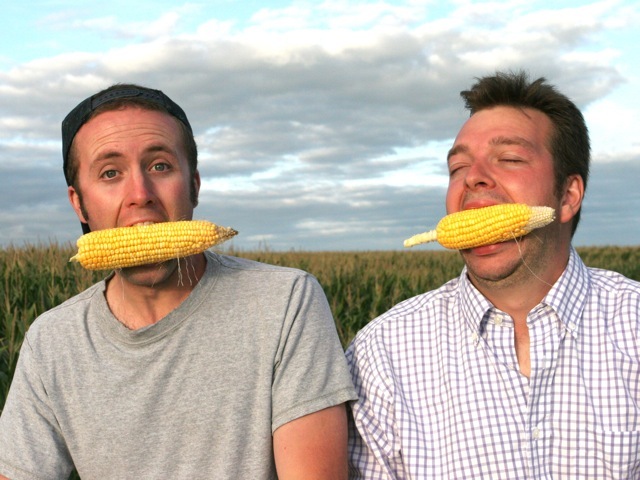 This is, I think, the reason Ian and I wanted to grow corn when we finished college instead of taking a desk job, and why we started work on "King Corn" with Aaron four years ago. Admittedly, growing GMO corn didn’t turn out to be as rewarding as growing actual people-food, but I think we’d plant something else on that acre if we did it again. I think beyond the obesity epidemic and the politics of the Farm Bill, there’s a cultural reason why so many of my friends are willing to go to a movie about watching corn grow — a topic that to an older generation is axiomatic for boring. There’s a new kind of back-to-the-land movement on right now, and it’s a whole lot of young people deciding to reconnect with something far away from the city. In a food system facing a lot of problems, I think that’s a hopeful idea. p(orange). 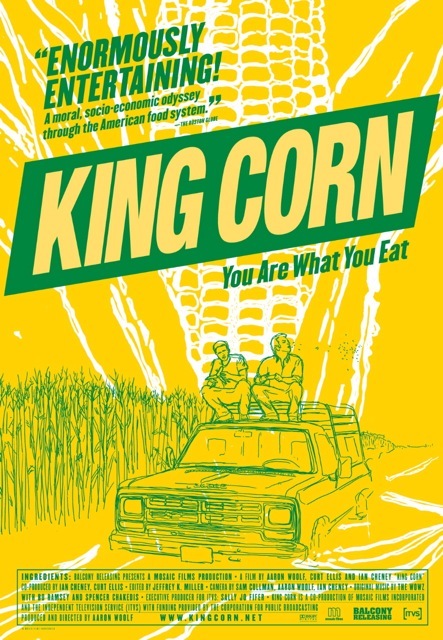 For the memorabilia fans among you, I've got a soon-to-be historic "King Corn" movie poster to give away. Leave a question or comment on this post and Culinate will choose one of you to receive this ultimate sustainable swag. p(orange). eBay power sellers need not apply. Acre of corn not included.